The borders of New York neighborhoods are defined by personal preference, belief, if you will. Late night, over my last drink, I’ve had many a passionate argument over where one begins and another ends. The Census might say Hell’s Kitchen goes from 34th Street to 57th, and that may be good enough for government work. But really, that’s ridiculous. Hell’s Kitchen goes from 42nd and 8th Avenue up to 55th Street and over to the Hudson River. From 42nd to 29th (I’m being generous Chelsea) is Midtown West –boring – and anyone living on 56th will insist they live on the Upper West Side. That’s pretty non-negotiable. So now that we know where we are, let’s begin. 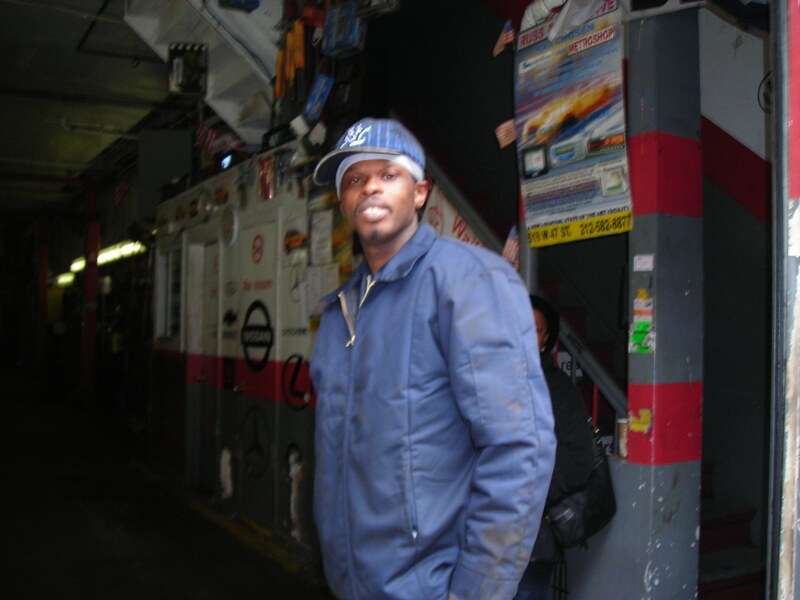 I got off the A Train at 42nd and 8th with the firm intention of going to Mid-Midtown – the financial center of the universe between 5th and 6th Avenues. But, it was a long train ride full of crying babies, delays, and one young man dead set on giving himself tinnitus by piping Sublime’s 40oz to Freedom directly into his ears at full blast, and I needed a cup of coffee. A good cup of coffee. Not the Starbucks and Starbucks-knock-offs fueling Midtown. (Side note –can some economists look into how subpar coffee effects rational behavior? I think I’m on to something here.) I’d visited Hell’s Kitchen only once before, but remembered distinctly a bakery near 50th with a line out the door and New York’s best sticky buns in the pastry case. Miraculously, I found it again beneath a blue awning reading Amy’s Bakery. It seemed everyone who’d passed me, and everyone I’d passed was heading there. Eventually, we all ended up in line together, with the exception of one elderly gentleman with a brown fedora and an Irish accent, who bypassed the queue with an excuse. Oddly enough, his coffee was waiting for him on the counter, and I thought him perhaps a holdover from the bygone mob days. At last, I got to the front, resisted, then gave into the temptation of a sticky bun, and ordered my coffee black. No sugar please, thank you very much. On to Midtown! But first I had to find someplace to eat my sticky bun, in peace. One of the odd things about New York is you forget how much water you’re around. The East River, the Hudson River, the Long Island Sound, the Atlantic, for example. Maybe it’s because the city is so self-contained, so completely encompassing that it seems odd it should end all of a sudden in murky blue. I hardly ever go to look at the water here though it’s something I could spend hours doing and so headed towards 12th Avenue with the idea I would find a nice sandy spot to sit, or at least a bench to watch the Hudson’s currents stream by. Getting there was of more interest than the destination however, since little did I know, the western most part of Hell’s Kitchen is a Mecca for taxi cabs. 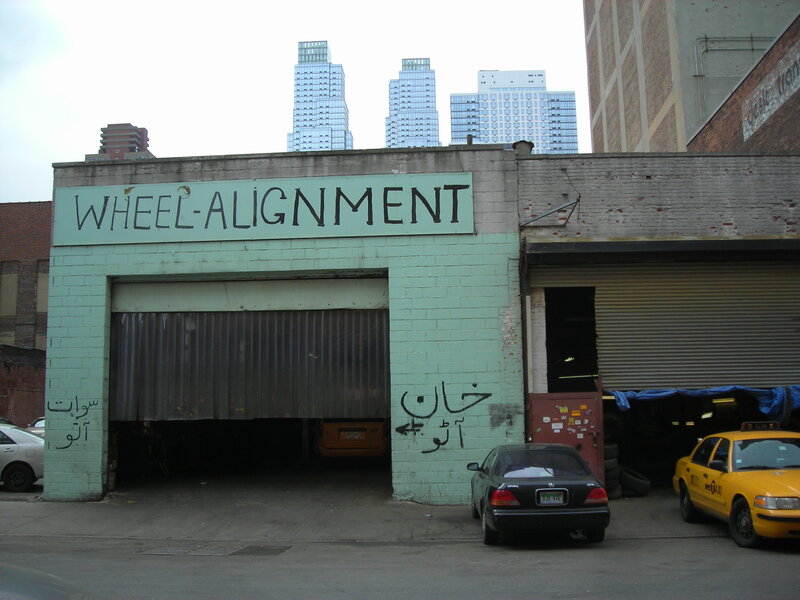 The double-digit avenues are chockablock with repair and wheel alignment shops – yes they are different – gas stations and car washes. You would think that river front property would be the most valuable. But, n o. Rectangular, gray, cement warehouses are in vogue from Tenth Avenue on. I found this both fascinating and charming, in an industrial sort of way, and asked one repair shop attendant if I could take a picture of their sign reading, “Respect the Neighborhoods.” He told me I’d have to speak to the manager about that, but readily volunteered to have himself photographed. He stuck a pose, I snapped. Handsome young man, don’t you think? A block more and I saw up ahead both the river and a very tall, very long chain link fence. Then, emerging from the corner, what looked like a stealth bomber. It was indeed, a stealth bomber, along with a few jets and four out of place commercial airlines, parked on the deck of the Intrepid – New York Harbor’s own aircraft carrier. With no way to get around this monstrosity to sit on my coveted beach (there were no park benches in sight) I found a desk put out by the dumpster next to a Red Bull vending machine and since my sticky bun had been whispering sweet nothings to me since before I bought it, sat and ate it there. Perhaps not the most sanitary of seating arrangements, but life, as they say, is tough and besides, I had a good view of what kind of people would pay twenty dollars to go on an aircraft carrier. All kinds, apparently. On my way back, I took 47th instead of 46th, hoping to find more interesting garages. Indeed I did – check out this hand written sign with Arabic characters on the side (does anyone know what they mean?). But even more intriguing was an unexpected little thrift store set up in the center of an otherwise residential block in what looked like to be a former hotdog stand storage space (there was one of these on 47th as well – slightly gross but no surprise there). Grainy Ranchero music screeched from out of date speakers and interior lighting didn’t seem to be a priority. However as anyone who knows anything about thrift stores knows, these are the marks of a goldmine. 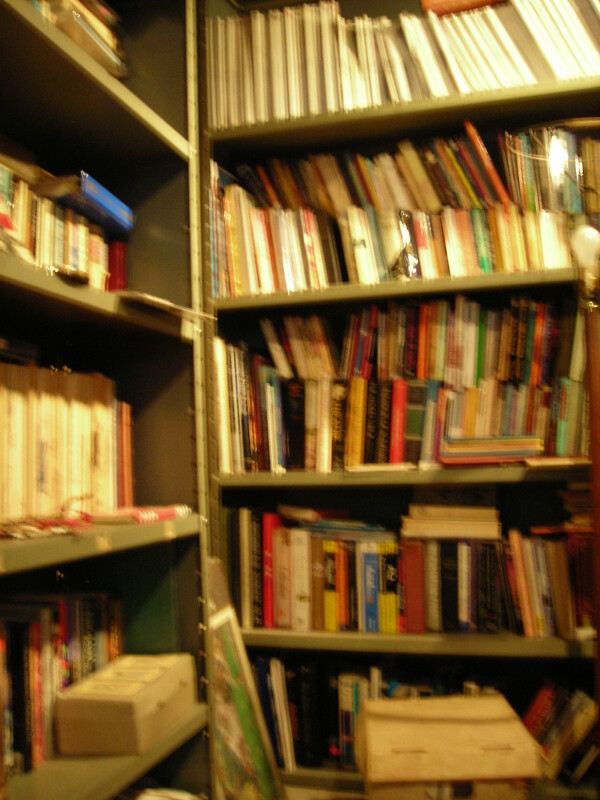 Two bookshelves housed titles ranging from Homer’s Iliad to Harlequin’s bodice-ripping classics. Across from that were a row of hairdresser’s chairs complete with beehive mechanisms – you know the old space-pod hair dryers that fit around your whole head. Along with an assortment of furniture in the back, I found a quite handsome briefcase of light brown leather, which I very nearly bought. It still had the name tag inside. D. Netzer. NYU 1 Washington Square. I looked him up later. He was a rather distinguished professor of that enigmatic field, Urban Economics and Dean of the Wagner School (NYU’s labor department) from 1969 to 1982. No wonder he had such a nice briefcase, and might also mention, handwriting. But how did all this stuff end up in one place? 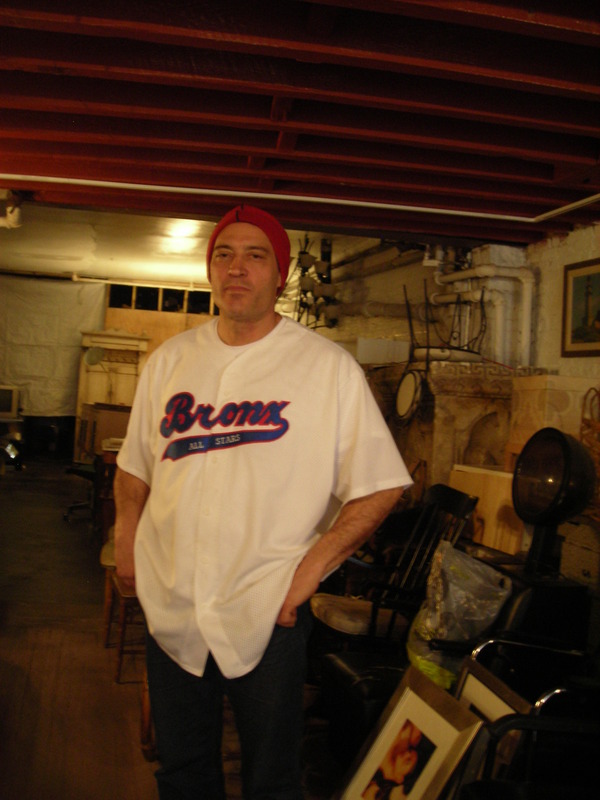 The owner and namesake of the store, Dominick– as you can see a nice fellow – explained along with the thrift s tore he has a moving and “clearing out” business. The latter being for those who don’t pay their bills. Some of his stuff he gets from auction, most he gets when the bank forecloses. The thrift store was his idea, a way to capitalize on cool stuff he would otherwise have to take to the dump. A community service if you ask me. He called it, “a blue collar thrift store,” unlike the wonderful, but truly overpriced empire that is Housing Works. So, should you desire a good book or a new hairdo, Dominick’s is at 453 W. 47th between 9th and 10th. Onwards, and upwards. By now I’d given up on the whole idea of Mid-Midtown and entered the Hell’s Kitchen Wonderful World of Restaurants. Think I’m kidding? For those of you who don’t live in NYC, or who do and don’t venture that high up in Manhattan, there’s a street called Restaurant Row, which is fully deserving of its title. I didn’t go there. 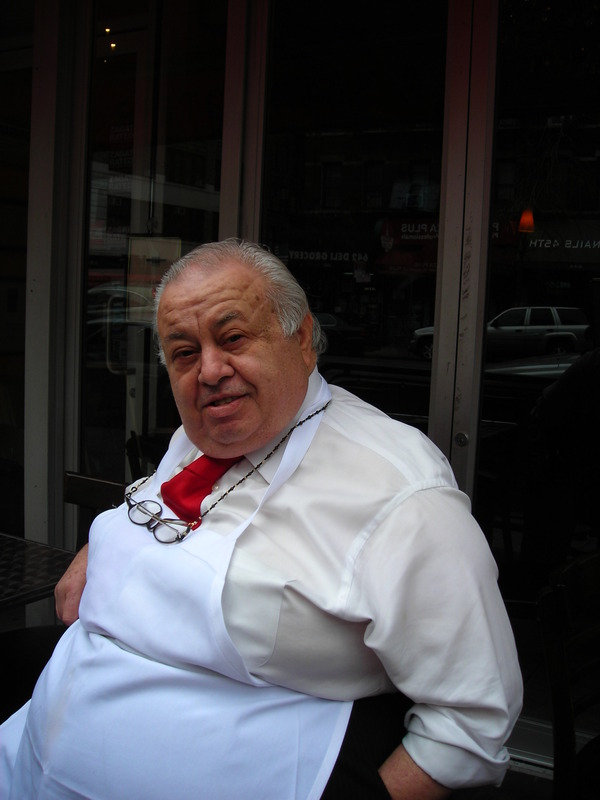 However, I did pass a portly man, to say the least, sitting outside of an Italian restaurant on 8th Avenue. I was a little reticent to approach him with my slightly shaky credentials as a blogger – who isn’t these days. But hey, everyone’s gotta start somewhere, so I hitched up my pants, and said “hey, I’m writing a blog about New York City.” He seemed none to impressed and when I asked for his job title, he said simply, “taster.” “How’d you get that job?” I asked, thinking of my own career prospects, and he explained that eight years ago, he’d come into the restaurant and proven his culinary prowess by tasting their food and – I imagine – liking it. The bartender inside, Francesco, was slightly more helpful. Sebastian, the taster, was really more of a greeter – the guy who tries to get you to eat there after a matinee of Bye Bye Birdie (don’t see that one) with witticisms like “You’re going to the wrong place!” or “We have everything but sushi.” Apparently Sebastian is somewhat of a New York institution and used to work in the East Village’s finest dining establishments. But he’s been a Hell’s Kitchen resident since he moved from “the hilly part of Italy” (his description) and wanted to work closer to home. He’s also, supposedly, but I don’t see how, discovered a recipe for flourless, eggless, sugarless cookies. I think I call that an apple. So, what’s the reason for this mass proliferation of restaurants? As I hinted before, Hell’s Kitchen abuts the famous Theater District where you can catch a Disney-movie-stage-adaptation on any day of the year and Tom Stoppard plays in the winter. But it’s not just the tourist that bleed over into Hell’s Kitchen. As I wound my way south down 8th and 9th Avenues, I found a startling number of churches converted into studios and workshops for actors and playwrights. 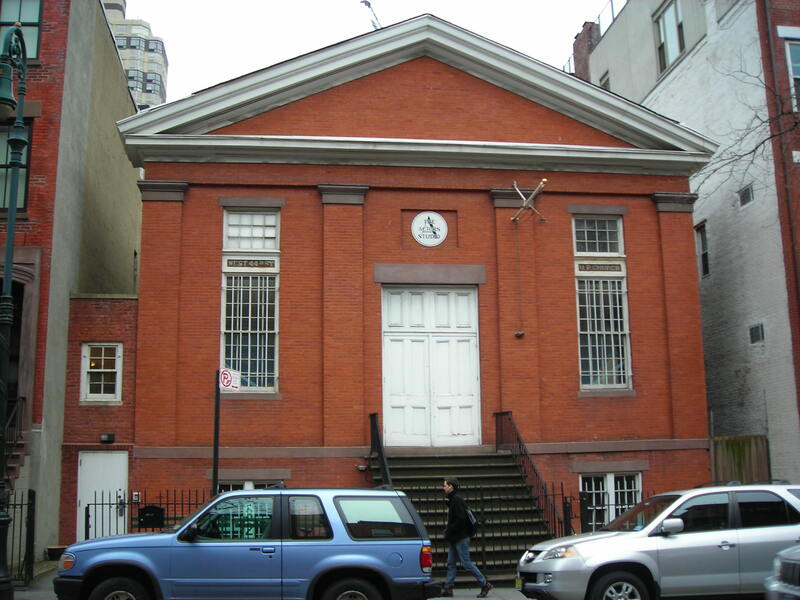 The well-known Actors Studio was once a United Presbyterian Church. (If you’ve never heard of the UPs, it’s probably because they haven’t existed since the 50s…just about the time the Actor’s Studio was founded…hmmm). I might also mention an anomaly about actual churches in Hell’s Kitchen – almost all have their own theater. The day was winding down, it’d started to rain, and my sticky-bun sugar high was wearing off at an exponential rate. Besides, I reached the end of Hell’s Kitchen at 42nd Street and a Dunkin’ Donuts with a very tall, very boring high rise as a back drop. And so, in summation, while thinking about that Dunkin’, I will say this for Hell’s Kitchen: it is an oasis of all the things that once made Manhattan great amid the money-driven desert that is Midtown. Despite the realtor’s dream of rebranding this neighborhood as “Clinton” (not such a good name either) Hell’s Kitchen is full of independent shops, small cafes, avant garde theater companies, and gorgeous buildings. So skip Midtown, and go straight to Hell – or it’s kitchen anyway. It’s nicer than you think. Fantastic piece! Can’t wait for the next walk, meanwhile I’m looking forward to going to Amy’s Bakery! Professor Netzer called. He’s been looking for his briefcase for years and will pay handsomely for it, perhaps in drippingly sweet baked products. 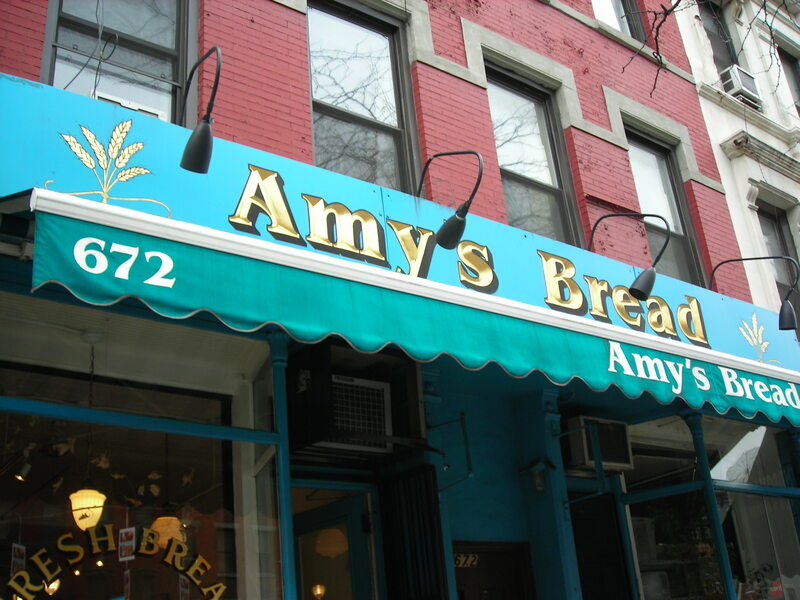 I love Amy’s Bread, have been there often, as my uncle lives in the area. I love the characters you met. But no mention of Daredevil, who patrols around HK? Hmm, what’s up with the research? I guess he is fictional and all. Hey, if they rename it Clinton, it will just mean a proliferation of McDonald’s joints, GAP stores, and cigar shops. Great stuff. Keep on walkin’! Will do Commodore : ) And tell Dr. Netzer the price is one fully stocked pastry case. No less!